I have a lot of food-related projects swarming around in my subconscious pretty much all of the time. Most of these are hypothetical projects that will never happen … like making a batch of every single chocolate chip cookie recipe I’ve ever seen so that I can once and for all decide which one I like the best and just discard the rest. (Wouldn’t that be convenient? I’ve accidentally pinned about 30 different chocolate chip cookie recipes, and they’re stressing me out.) Another hypothetical project I wish I could tackle is to make every single recipe in every single cookbook that I own (which would take me 18 lifetimes). In lieu of doing that, I can at least keep trying to make more of the recipes I haven’t tried yet, so … that’s my pathetic compromise. 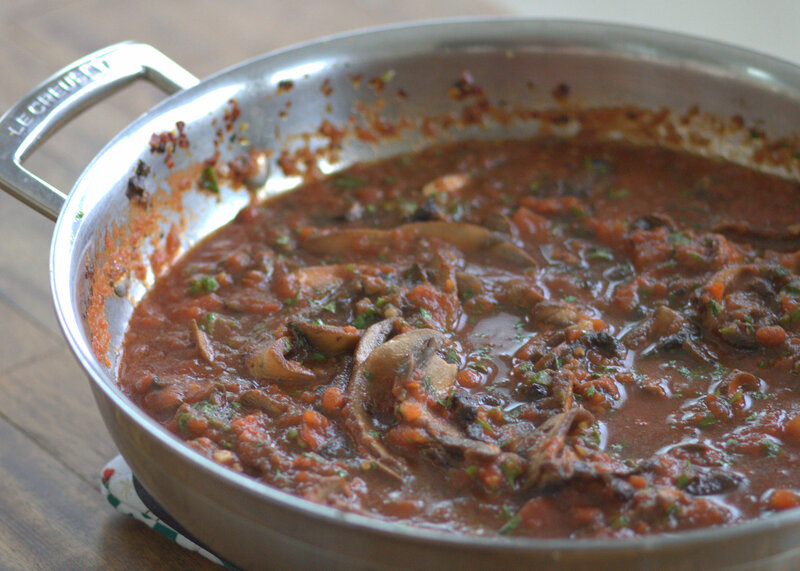 And without further ado, that brings me to this recipe for Pasta with Portobello Sauce! 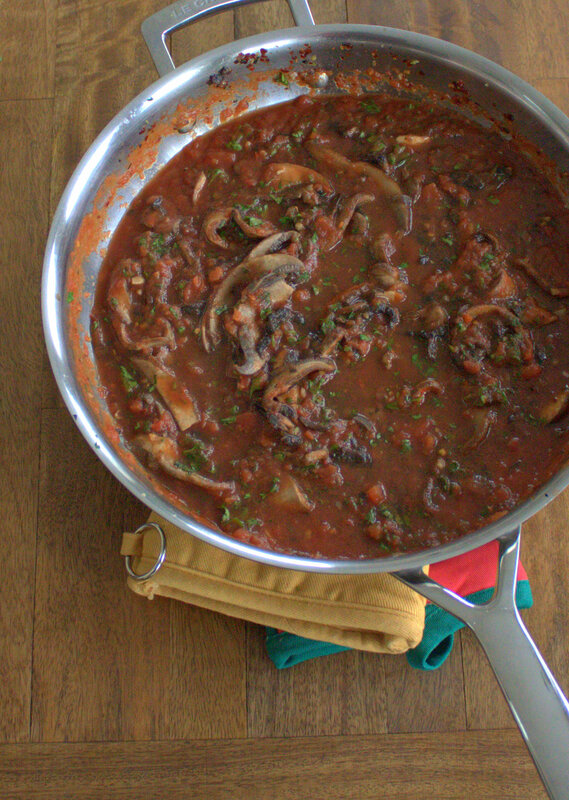 A classic from Rachael Ray’s original 30 Minute Meals cookbook! I periodically pick up a cookbook to flip through and see what recipes I haven’t looked at in a while with the intention of trying something new. This recipe is from one of the very first cookbooks I ever owned, 30 Minute Meals by Rachael Ray. Apparently, you can now buy this cookbook for $0.01 on amazon.com, and you probably should because it’s really good. 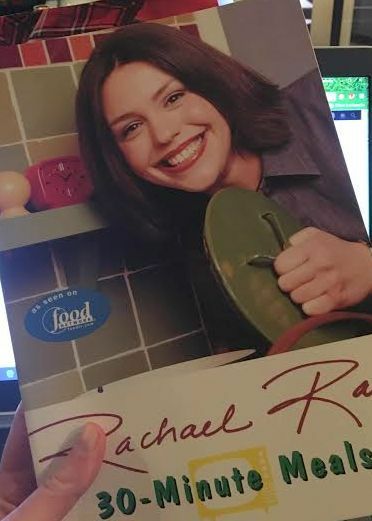 I got this cookbook almost 15 years ago in the first couple years of college during which I also happened to be in the process of beginning my obsession with the Food Network. I’m really quite sentimental about the good old days of the Food Network. I like to think I was there before it was cool. In any case, back then you could still get a hip cookbook that wasn’t all pictures. These days, it seems that cookbooks are mostly pictures with a few recipes squeezed in which I’m not complaining about because I’m easily distracted by pretty pictures of food. Anyways, what I’m saying is that this is an old classic, and I love it for that very reason. And I haven’t even gotten to the part where I talk about the food yet! All this cookbook sentimentality has distracted me. 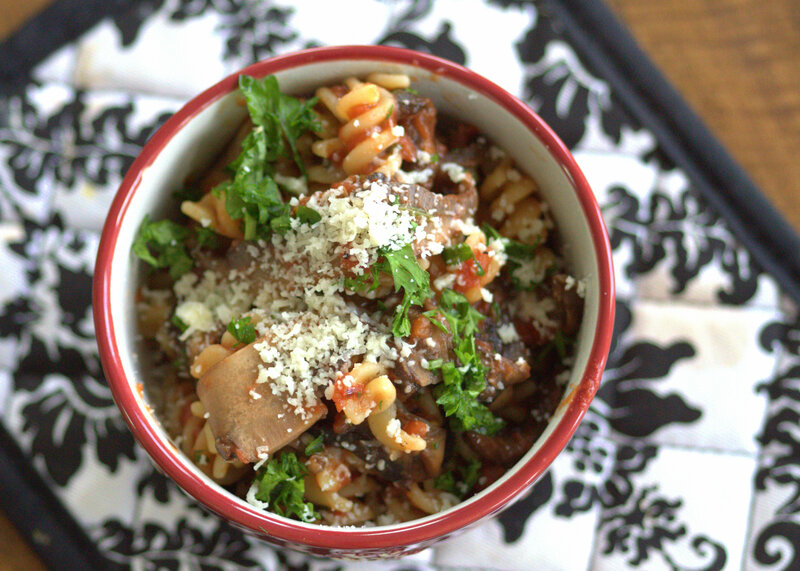 We’ve been into cooking more meatless meals lately, and this pasta with portobello sauce was a good fit. 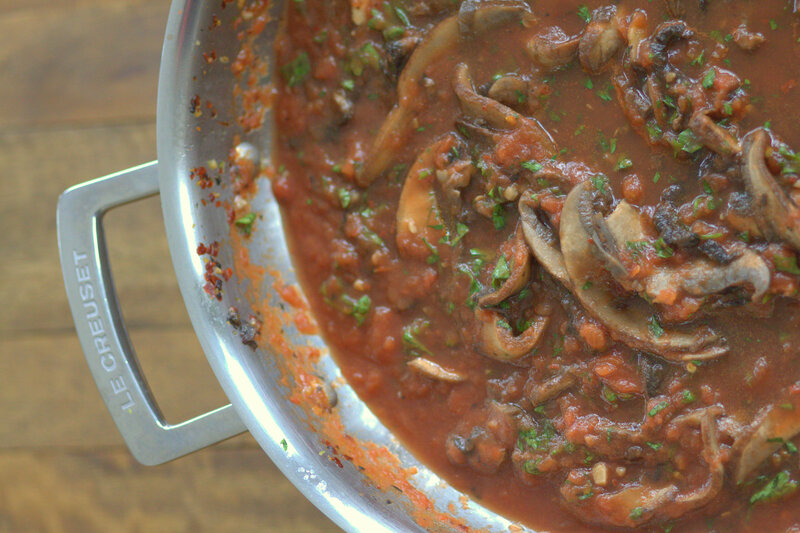 It was easy to make, it had TONS of flavor, and we looooooved it. Looooved it. So much that we’ve already made it twice, and it will definitely be made again. With so many recipes out there in the world to try, it says a lot if you’re willing to give one of them the opportunity for a repeat performance. At this rate, I will never make it through all my cookbooks. Oh yeah – it’s delicious – you should definitely make it!